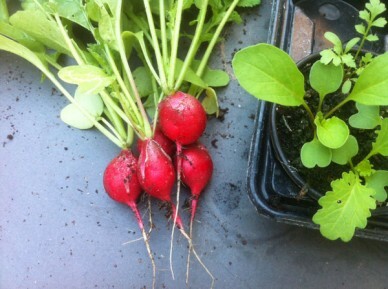 Radishes are one of the quickest and easiest salad vegetables you can grow. They come in a multitude of colours and sizes, can be grown as easily in pots as in the ground and have spring and winter varieties too. A great one to give you a bit of confidence if you are new to growing but also a staple of many an allotment, garden plot or windowsill for the more experienced. You can eat the leaves of most varieties too although some can get a bit spiny when older. The one thing you do need to get right is the soil. Radishes can be tolerant of many soil types but the perfect environment would be a good, well draining loam. It should be fine, loose and have no stones. For smaller varieties cultivation can be fairly shallow, perhaps 5-10 cm but for larger varieties you may need to dig down to 30 cm or more. You can add sand to improve texture and organic matter to improve condition. Radishes need to be grown in a sunny location but not too much direct sunlight as this will cause them to bolt and go to seed quickly. For this reason, some growers recommend not growing them in the height of summer. Sow seeds 1/2 inch (1.5cm) deep and spaced about 1 foot (30cm) apart. Seeds should be sown in small groups of three to four, about an inch apart, pulling out weaker seedlings as they sprout and depending on the variety, thinning them to about two inches as they grow further. Refer to the packet or supplier recommendations for larger varieties. Don’t let the soil dry out completely as this may cause the roots to crack or become woody. Water regularly to keep the soil moist (not soaking) and soft and your roots should maintain their shape better. The quickest growing varieties will start to sprout in as little as three days and can be ready to eat in around three weeks. Larger winter varieties take longer at up to eight weeks. They should be harvested when at optimum size as leaving them in the ground will make then tough and unpalatable. They are not entirely problem free and you will need to keep an eye out for slugs, snails, flea beetle and caterpillars who will feast on the leaves. Brassica downy mildew can be a problem but less so than with other brassicas as they are often harvested much more quickly. However, look out for yellowing leaves with white furry patches on the underside. Remove and destroy any affected plants.